The grey marbled M200, a finish also known as the silver pearls, is a frequently encountered variation of Pelikan’s Classic line. These are quite commonly found for sale on the secondary market and are, in my opinion, one of the more distinguished appearing variants of the M200. It likely made its debut sometime around 1988 in the ‘old-style’ trim variant which was distinguished by a derby cap top, double cap bands, and the absence of a trim ring at the piston knob. This finish also was utilized in an older run of M250’s for the export market. In the M200 line-up, this model persisted along with its blue and green marbled siblings up until and through the revision of the line in 1997. While the ‘old-style’ grey marbled M200 is commonly encountered, the ‘new-style’ variant sporting the post-’97 trim is seen rather infrequently. This variant displays the newer crown cap top, single cap band, and features a single trim ring at the piston knob. It is seen so infrequently that I have heard some question its very existence. Rest assured, there was a ‘new-style’ M200 silver pearls though it was indeed a short-lived variant which is why it is seen so seldom when compared to the blue and green marbled finishes. While clearly depicted in the 1997 catalog, by around 2000 it is no longer found indicating that, for reasons unclear, this model enjoyed only a very short run overall in the newer trim style. 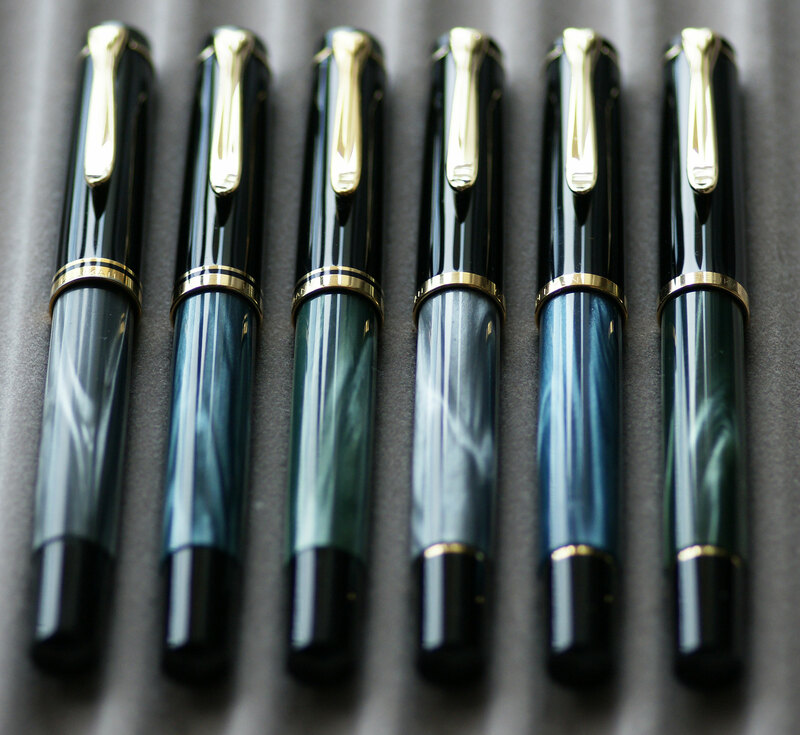 While sparse in number, these pens remain very attractive additions to the M200 line-up and I would encourage anyone who has the fortune to come across one to not pass it up lightly. I have the more-common ‘Old Style’ in pearl gray. What makes it interesting is it is embossed with the State Seal of the reunified Germany and the signature of Ramon Herzog, the first president of the reunified country. 1994-1999. This may be proof of the popularity of this model … to be awarded to those who worked for his election as keepsakes. An interesting piece of trivia. Thank you for sharing! What would you value a fountain/ballpoint set at? I have just acquired one and can’t find anything on the set. I have been able to figure out that it was pre-1991 due to the derby cap and the W. Germany label on the cap band. Any help would be much appreciated. Hi Terry. E-mail me at thepelikansperch@gmail.com and I’ll try to help you out. If you can include a few pics of the set, I should be able to help you with an identification and give you a sense of the value. Does Homeowners Insurance Cover My Pen Collection? Merz & Krell – Who Were They? Polystyrene – What is it Good For? All rights reserved. Unauthorized use and/or duplication of this material without express and written permission from this site’s author and/or owner is strictly prohibited. 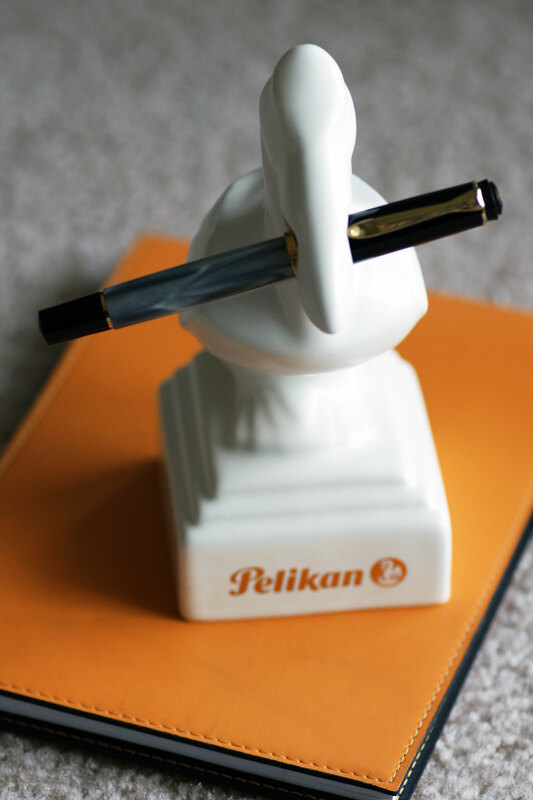 Excerpts and links may be used, provided that credit is given to Joshua E. Danley and The Pelikan’s Perch with appropriate and specific direction to the original content. Please use the Contact Form for all other requests.